The hot summer temperatures this month will make daytime fishing tough. Your best bet will be early morning, late evening, and nighttime fishing. A thermocline will most likely form by middle or end of the month, causing fish to suspend in the water column. Depending upon condition the thermocline normally forms between 35 and 45 feet deep. Below this level oxygen levels are low making it uncomfortable for fish. Turn the sensitivity all the way up on your electronics to locate the thermocline. It will show as a horizontal line across the units screen. Once it’s located position your baits at or just above that depth. Trolling in open water areas will produce best. I troll between .3 and .6 mph over schools of suspend fish. Fresh cut baits work best for this application. 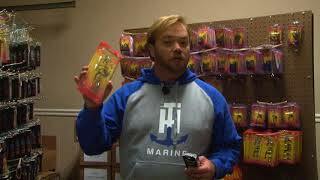 At night, fish livers, guts, worms, and cut baits under a float for smaller fish. July is a great month on Pickwick Lake. Fryer size catfish can be caught readily below Wilson Dam. Search for fish schooling along the walls of the dam. Fish can often be seen schooling on the surface feeding on the newly hatched shad along the dam. Eddy pockets on both sides of the lake from the dam to Riverfront Park will hold channel cats. For big blues, target blowdowns along the main river channel banks. Anchor your boat upstream of the trees and present your baits just upstream and in the end of the trees. Freshly caught cut skipjack will work best. July is the best month of the year for me when it comes to big stripers. Fish will school in open water and the mouths of tributary creeks. If the dam generates good current flow for several days, these fish will school in good numbers in the tailrace. I use live gizzard shad, 4 to 7 inches and skipjack to target these fish. If no live bait is available, Mister Twister RT Slugs and 6” Salty Shads fished on a ¼ ounce lead head will do the trick. Best colors for Pickwick are White Pearl/ Black Back and White Pearl / Blue Back. For fishing charters for catfish, stripers, or live bait bass, contact Captain Brian Barton at brianbartonoutdoors@aol.com or visit us on the web at www.brianbartonoutdoors.com. Catfish can be caught from one end of the lake to the other this month. There will be both spawning and post spawn fish located throughout the lake. The Wheeler dam tailrace will be loaded with fryer size fish. Drift chicken livers and shad guts from the dam downstream to Town Creek for best results. For bigger fish try the ends of long points and bluff ledges in 25 to 40 feet of water. The bluffs from Spout Springs to Lime Kiln Hollow will hold some good fish. Peach and Walker Islands will hold some trophy fish. Search for the isolated standing timber then fish straight over the cover with a vertical presentation. Make sure and use heavy equipment so you have the power to wrestle the big boys out of the cover. I use BnM Silver Cat Magnum rods spooled with 85 pound test Hi Vis Vicious braided line with a 50 pound mono leader on a Carolina Rig. 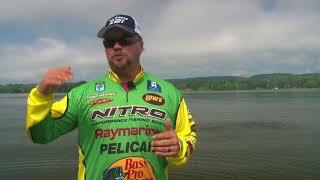 A 7/0 or 10/0 Daiichi circle hook is a must for battling big fish out of the heavy cover. Catfish on Pickwick Lake will be more scattered this month. Best bets are the mouths of creeks and the main river channel. I like to anchor on the upstream points of feeder creeks and make long cast into the channel bottoms behind the boat. A Carolina rig is best here. 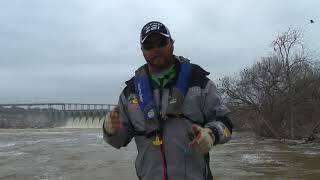 For fishing the main river channel, drifting with a three way swivel rig or bottom bumping rig is best. 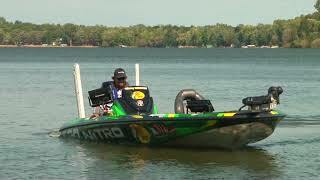 Keep the boat sideways and drift with the current bumping your bait up and down off the bottom. Largemouth and Smallmouth bass will be positioned on the deep river ledges making them an easy target for live bait fishing. Present live shad at or just above the level the fish are holding and hold on. I use either a split shot and hook or a slip float depending on the current and the depth of the fish. June is one of the best months of the year for good numbers of bass. For guide trips for catfish, live bait bass, or stripers contact Captain Brian Barton at brianbartonoutdoors@aol.com or visit us on the web at www.brianbartonoutdoors.com. You can pretty much pick your species this month on both Wilson and Pickwick Lakes. Catfish will be wide open on both lakes. On Wilson, fish in the sloughs and along shallow bluff lines. Search for hard bottoms, pea gravel and hard clay are best. Fish will be gorging themselves in preparation for the spawn which will start later this month. Chicken livers, worms, shrimp, and shad guts will all produce plenty of eating size fish. For bigger cats, use whole live shad or larger chunks of cut bait in 25 to 40 feet of water. Look for fish to be holding close to wood cover where available. 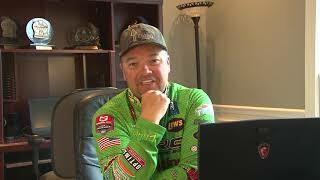 The best catfishing on Pickwick will be the tailrace of Wilson Dam. Cats will school in large numbers underneath the dams this month. If you prefer to avoid the turbulent waters of the dam, fish the channel ledges and adjacent flats from Pride Landing to Waterloo. Channel catfish will be bedding this month. Search for them along the base of shallow bluff lines and cypress knees. Prepared baits such as Secret 7 and other blood or stink baits work best on these fish. Smallmouth bass will be post spawn now and pulling back off onto the river and channel ledges. Largemouth bass will be in transition from spawn to post spawn this month. They can still be caught in relatively shallow waters. Bluegills and Shellcrackers will be bedding also. Use crickets and worms for best results. Luck for bedding bream along pea gravel banks with overhanging limbs. Search out coves or pockets on the north or northeastern shorelines for bedding locations. For guided fishing charters for any of these fish contact Captain Brian Barton at brianbartonoutdoors@aol.com or visit us on the web at www.brianbartonoutdoors.com. 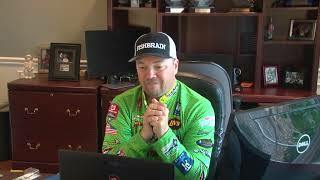 The catfish bite will really start to heat up this month. Smaller cats will begin to invade the sloughs and shallower water to begin gorging themselves with food for the upcoming spawn. Target gravel bars, ledges, and main lake humps with hard bottoms for the best action on the eating size fish. 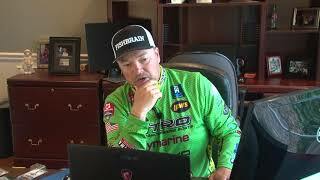 Whether trolling or anchored fish your baits right on the bottom. Chicken livers, shad guts, and shad minnows are best this time of the year. For the big cats focus on deeper ledges with wood cover and the front and back ends of the humps and islands. Use large chunks of fresh skipjack or cut shad heads along the structure for the bigger fish. Peach and Hog Islands are hard to beat this month. Big cats are caught every spring along the clay bottoms just offshore from Robert Trent Jones golf course. Pickwick Lake will produce some of the largest smallmouth bass of the year this month. Depending upon the water temperature the majority of the smallmouth will spawn in mid- April, which means they will have their heaviest body weights of the season. Target these fish on gravel bars adjacent to the main channel. Good areas include Brush Creek, Second Creek, and Pride Landing. The fish will be in 6 to 12 feet of water depending upon the water temperatures. I use an 8 foot BnM Float N Fly Rod to present live shad with a small split shot or no weight at all to these fish. The “ Horseshoe” is a community hole located just below Wilson Dam which will also hold good numbers of fish this month. For guided trips for catfish, live bait bass, or stripers contact Captain Brian Barton at brianbartonoutdoors@aol.com or visit us on the web at www.brianbartonoutdoors.com. In my opinion March is the absolute best month of the year to catch a trophy smallmouth bass and one of the best months for trophy catfish. This makes it my favorite fishing month of the year. Big smallmouth will be holding on channel ledges, ditches, and humps waiting to move up for the spawn which starts the end of this month. Look for hard bottoms with some wood cover nearby. River ledges from State Line Island to Wilson Dam will hold fish. The key is to find the right bottom and cover. 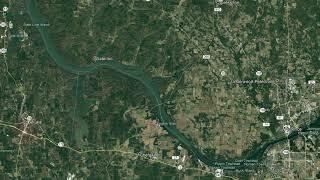 I like to anchor just upstream of the area I want to fish and present a live shad minnow on a Carolina rig to the fish. Fishing stationary versus drifting allows me to put the bait right in the fishes face and eliminates hang-ups. This is a great time to catch a big blue catfish on Wilson Lake. They are still in their deep wintering holes for the most part but they will begin to feed more aggressively. Isolated structure from Shoals Creek to Town Creek will be your best option. If time allows, ride slowly with your electronics and try to locate schools of large fish. If fishing time is limited target the base of the ledges with wood cover. In the lower lake I fish the 50 to 70 foot water, in the upper portion of the lake fish may be as shallow as 15 feet deep. 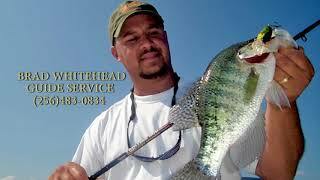 For the trophy fish I usually anchor and fish large chunks of fresh skipjack or shad. Set up for at least 20 minutes on a spot before giving up on it and moving to another location. Stripers will start to school up at the base of the dams this month. Fish will locate in the seams between turbines and along rock piles just off the edge of the current. I like to cast a Mister Twister 4” Sassy Shad on a ¾ or 1 ounce lead head. Pearl / Black and Pearl / Blue baits seem to work best. 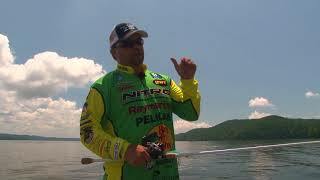 The best time to target Stripers is when the dam is producing maximum power generation. For guided trips for catfish, bass, or stripers contact Captain Brian Barton at brianbartonoutdoors@aol.com or visit us on the web at www.brianbartonoutdoors.com.